Observation - large mite - UK and Ireland. Description: Long-legged mite found rapidly wandering through fungus under log. Note dead beetle larva in the general shot to give some idea of scale. 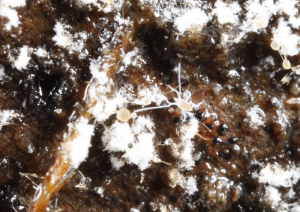 Long-legged mite found rapidly wandering through fungus under log. Note dead beetle larva in the general shot to give some idea of scale.